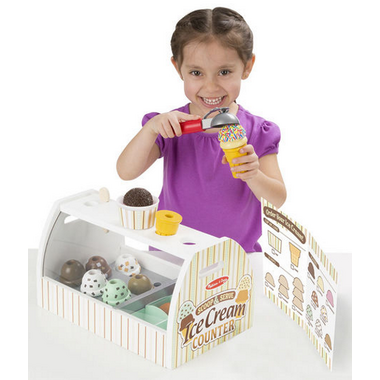 Scoop up some cool treats with this all-inclusive, 20-piece pretend play ice cream counter! The sturdy wooden tabletop counter holds eight wooden scoops of different-flavored ice cream, six assorted toppings, two cones, a plastic cup, an ice cream scooper and a wooden spoon. The scooper fits into a hole on top of the scoops to lift, stack, and release. Take orders on the reusable menu card and serve up delicious fun! Product arrived quickly. Love the look of this product! Canâ€™t wait for my daughter to open it on Christmas! 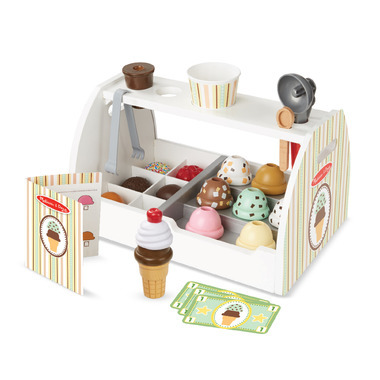 We have the other Melissa & Doug ice cream set and my daughter enjoys playing with it so I purchased this ice cream counter set. I was disappointed that the ice cream did not stick together with magnets like their other ice cream set. This counter set has the ice cream scoops click in together instead but my 5 year old loves playing with it so I'm happy with my purchase. My kids just love this! Great quality! It is a toy that will grow with their development! The product is actually pretty large! A fun gift for both my son and daughter! An adorable toy. Bought this for my doughter's christmas gift. I'm sure she will love it!